Looking at finally getting my first pin. I want NIB and due to budget, looking at Stern Pros. I want to get something that is deep enough to hold my interest for awhile, with bonus points going to theme, art and sound/music. I've played most of the modern Sterns a fair bit and have landed on SW and IMDN as my finalists (also liked Deadpool and Guardians, but found they weren't as deep as SW/IMDN). I love the layout of IMDN, the multiple goals (modes, power features, loops, etc.) and that there will always be something to strive for (i.e. Number of the Beast, Run to the Hills modes). I'm ok with theme, music and art (I like metal, but never followed the band), though my wife and daughter (who are moderately into pinball) aren't really into it. Getting metal ramps instead of plastic is also nice. SW is a dream theme and my family are big fans. Love the art, sounds and music. I know this shouldn't factor in as much as gameplay, but there's something to be said about the look and sound of this very expensive piece of furniture fitting in the home. I really like the feel and flow of SW and the rule set is fairly deep. Not only mastering the modes and shots, but also managing the multiplier (both hitting the center targets and re-orienting the shots on the fly) gives the player a lot to do, and I like the idea of chasing defeating the Emperor. Looking for opinions on these two. I'm leaning towards IMDN due to the value that it brings as a whole, and a part of me feels that the gameplay will likely hold my interest longer vs SW, but I'm curious what others think, especially those that own/have owned both. Hah me either. The real choice is both! That said, I prefer SW over IMDN. However, SW is a much more unorthodox ruleset and game. SW is not for everybody; it is brutal, it is deep, it has breadth, Adrenalin, anger, darkside, light side, force, all of it....except dolls (haha jk); all this with a beatable ruleset that keeps you coming back with different ways to play. IMDN is a much more traditional ruleset and game. Gameplay: SW if you prefer fast, flow, and brutal. IMDN if you prefer something slightly different. Rules: this is tough. IMDN has better modes, choreography, and objectives. But SW has so many options and diversified that given it last ability. Fun: if you like Adrenalin and brutality all in one SW wins. If you like something friendlier, easier, with longer ball times IMDN. Last ability: see above (fun section) but SW always keeps me coming back. IMDN is the type of last ability that is always fun to come back to every once in awhile but not everyday like SW. Conclusion: IMDN is the total package: Art, sound, layout, gameplay, rules. But while SW lacks in art, call outs, choreography, it makes up with last ability, Adrenalin, and fun in a big way. Conclusion #2: if you want something that checks all the boxes with a polished ruleset and code team that continues to iron out bugs, go with IMDN. If you want a game that’s fast, in your face and will keep you playing over and over despite lacking polish and choreography and (probably) future code support, go SW.
SW is my pick because of its overall unorthodox package and replay ability fun factor. Have both and lean towards SW a small amount, but they re both tons of fun and so diff'rent. For me it comes down to the scoring aspect and whether the multipliers are for you. Iron Maiden is great pinball, theme aside. 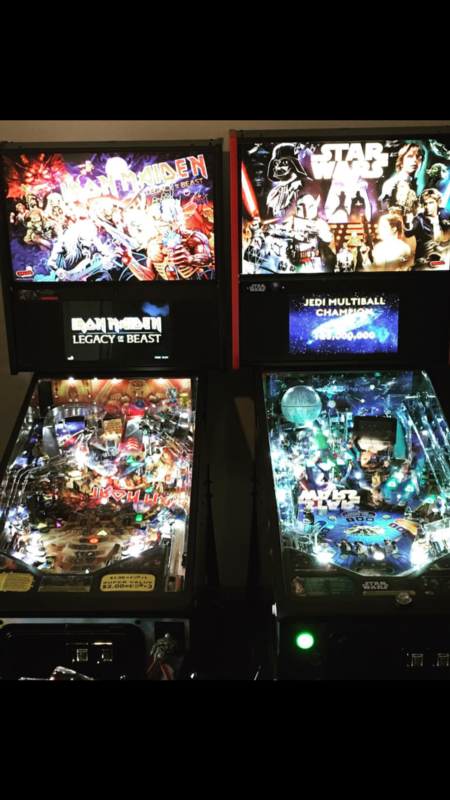 Star Wars is awful pinball, save for the theme. Iron Maiden by a mile. SW has a better theme, but that is it. I would probably go SW in that case. If it's really just going to be you playing in reality, get what you want - I would (and did) get IMDN. My favorite machine that I've owned, or even just played. 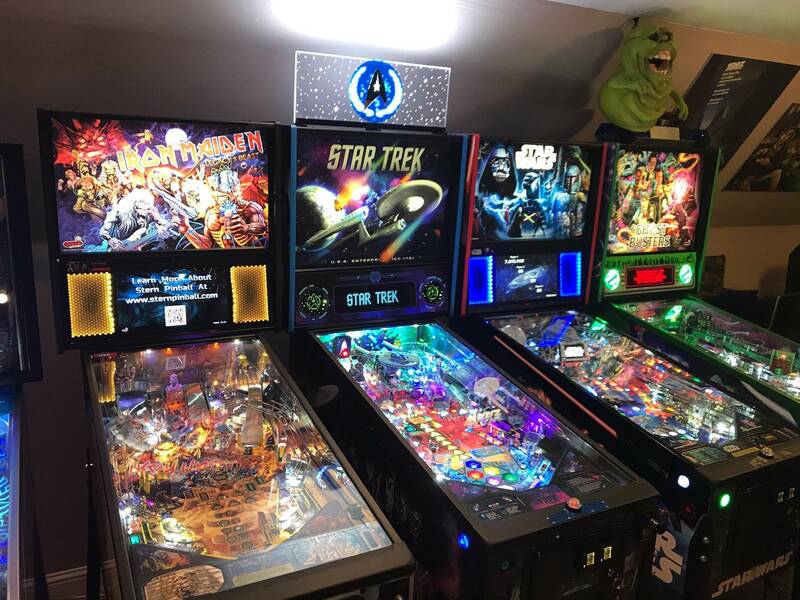 I love the Star Wars theme and it should be a no-brainer for me, but I just don't like the SW pinball machine... Really disappointed in that machine myself. Iron Madien by a long shot. If you don't like Maiden for whatever reason, I'd get a nice Tron or an Iron Man before buying a new SW.
Save up . Premium is right way to go on both arguably. Pro is simply not going to cut it. I hate iron maiden music and still own an iron maiden because the gameplay is amazing. You sorta hear the music while you play. But has time is passing by Im finding myself liking more the tunes. Gameplay iron maiden wins hands down. Not even close for me. Iron Maiden has my vote. Yeah. Newton ball nightmares plague the premium/le (why redesign a tried and true mech). We are constantly removing it from our tourneys because of random scoring from them. I'll take a pro all day on IMDN. I even like the pro on SW better. I find it difficult to see the value vs price diff in the recent pro vs premiums from Stern. If you like Star Wars and your family likes Star Wars, that would be the pin I bought. Um, do you think this makes any sort of point? If people hate Star Wars, why would they own it? Obviously people who hang onto it happen to like it.. I'm a huge Star Wars nut, pretty decent collection of stuff, figures etc, in the hundreds, even enjoy the new films more than most. Pretty meh on Iron Maiden, the music grates on me after a while, too much high pitched singing for my tastes. I dig Eddie though. Anyways, point is, I'd be into owning an Iron Maiden, zero interest in Star Wars. Theme is cool, but gameplay is what matters, and Iron Maiden plays great, and Star Wars doesn't hold my interest. I have owned both Pro's. My family and I are huge Star Wars fans, and not Iron Maiden fans (although I am an aging metal-head). Iron Maiden is a much better game, and much more fun to play and own. I have and enjoy both. Depends on what kind of game you want, SW is quite complex, lots of modes, stacking modes, moving around multipliers - and a much better theme. IM although SW is super fast and flow-ey, IM has more shots and is just a great fun shooting pin, code depth is medium, still great for home use, just not as complex as SW. Try both, some guys cant handle the music on IM, I like the art, callouts, music and lighting on both. I'm probably in the minority, but I much prefer SW. For some reason, the gameplay on Iron Maiden just doesn't do it for me. SW is hard as hell, but it's a game that I keep coming back to. That being said, if I was going to buy a SW, I'd probably go for the premium. I think the extra features are worth the higher price tag. Bought a SW Priem NIB because it’s a dream theme. Sold it and bought a pro because the hyperspace ramp stinks. Still couldn’t get into it. Before I played IMDN, I couldn’t have been less interested. Watched some early streams and bought a pro. Loved it so much I over paid for an LE. Music aside, the layout and rule set are just fun. SW theme might be better in your home but IMDN gameplay for casual players is superior. To sum up this thread so far; IMDN wins. Iron Maiden. Not a fan of the band but enjoy the pin much more than Star Wars. Disclaimer, my wife saw and played IMDN at expo and said it's banned in the household with the young grandkids. I have SW's and was looking at it for about 10 months before purchase and really like it. That being said I find it very difficult and it's beyond my abilities. Most times I don't get past first base but the few times I got to 2nd it was awesome. It's one of 2 games I own I can play for an hour or more straight and be happy. I voted SW but IMDN played much easier, and was kool , I probably wouldn't like the music but couldn't hear it at expo anyway. I love the SW theme more than IMDN because I casually listened to them while growing up but our family is just crazy for Star Wars. That being said I haven't owned Star Wars because of the plastic ramps on the pro and how stripped down I felt the title was. I played it a bunch at shows but just couldn't get into it. The 1st time I saw IMDN I knew I was going to own one. Great value pro wise, gameplay is just fantastic and addictive. I made a deal at Pintastic this year for a pro and since I've had the pin set up I've neglected my other games and some family members. As for taking family into account; if you think they will continue to enjoy it after the honeymoon phase get them the SW, but if you know it's just going to be you in the long run choose IMDN. I sometimes yearn for the premium for the complete package but almost 2k for the extras I'll stick with the more dynamic art package of the pro. I own and enjoy both. If your wife and Daughter are moderately into pinball I would get SW. If they enjoy playing with you that is truly special. Priceless! I wish my wife and kids played more often. If they don't like the theme oor music of IMDN you are not off to a good start for them enjoying it in the future. The shots on IMDN pro are a little more difficult than the Prem. You need to hit the ramp just right to start modes. The 4 flippers on IMDN are tough to get used to for moderate players, like your family, and newbies. The above being said if you do buy a pin based partially on your family choices and they don't play then when you are done with the game just move on from the "family pin" and get whatever you want from then on. Don't be surprised if you get some grief when you mention selling a game they like but never did play. It will happen. Just sell and get what you want and they will not care the switch was made a week later. I can't tell you if I like IMDN or SW better. It goes back and forth and will likely be this way for a long time. Based on your preferences, it sounds like SW would be a better fit. I own both, love both, but if you’re meh on the IMDN theme, I don’t think the game (as great as it is) will change your mind.